robálo, O. Cast. lunbina, róvalo, robálo, Cat llobarro, L. Dicentrarchus labrax, Eng. sea bass. It is a salt water fish living in the Mediterranean and in the Atlantic surrounding Spain. It has been an important edible fish, since Phoenician times. In Granada and Malaga it was most highly valued as in the rest of Iberia. It is especially popular when baked in a bed of salt. Sea bass is an ingredient with pigeon served in capírotada (a sauce for fowl) described by Villena. This fish can grow up to one yard long and is slender, with a moderately hocked tail and large mouth. It is grayish green on top and silver underneath. It can weigh as much as 10 kg. It is a tireless swimmer going to the bottom of the sea in search for food. 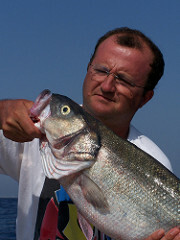 Sea bass is ferocious when attacking mollusks and crustaceans. Younger fish form groups while older fish tend to be solitary. It has a high resistance to change in salt quantities in the water and, therefore, can be found in rivers and lakes close to the sea. See capírotada, lisimaquia, and palomino. Scale and gut fish or have the fishmonger do this. Leave the head and tail intact. Wash the fish and dry it with paper towels. 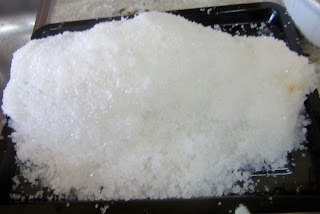 Make a paste with rock salt and water. Line a roasting pan with a layer of the salt paste. Slice the orange and lemon and place 1/3rd of the herbs and slices of fruit on this. Add the fish. Stuff the the gut of the fish with 1/3rd of the herbs and fruit and the remainder on top of the fish. 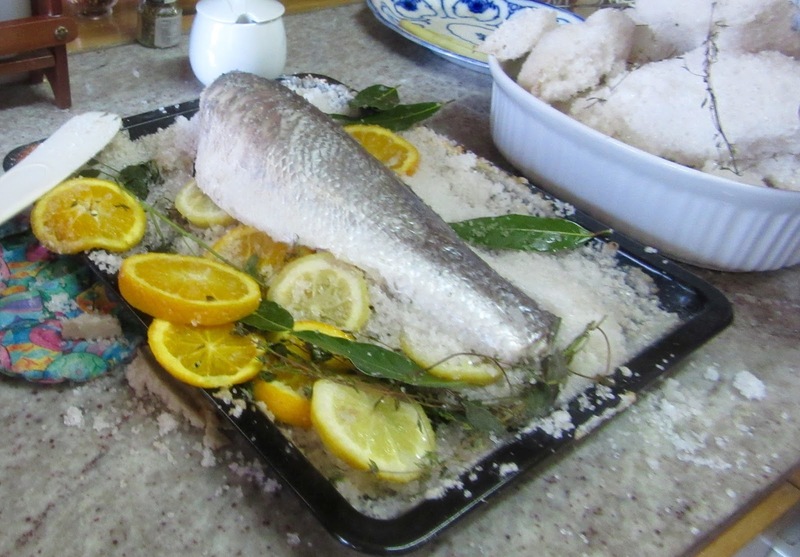 Cover the fish with the remaining salt and water mixture. Place the roasting pan in the oven and cook for about 25 minutes or until done. Remove the roasting pan from the oven. Break the salt crust with a spatula. Using a pastry brush remove salt crystals from the surface and around the fish. Place the fish on a platter. Remove skin and fins. Decorate the fish with lemon and orange slices.